A group of Western Isles creel fishermen are being issued with free lifesaving distress alarms following a fundraising effort. The move is thanks to local funds raised in memory of a colleague, Iain Mervyn Macleod. Mr Macleod drowned, aged 44 years, in a tragic accident in the sea at Great Bernera, off Lewis, in 2013. The family set up a fundraising campaign called Motivated by Mervyn in his memory and embarked on events such as a 5K run, ceilidhs and café nights to generate money. The main focus is to help supply fishermen with safety equipment. In the first distribution round, some 32 satellite-activated distress personal locator beacons (PLB) are being donated to shellfish fishermen in Lewis and Harris who work at sea on their own. A lone person working creels for lobster, crab or prawns around the coast have no back-up and little chance of raising the alarm if fishing operations go wrong. Coasting around £200 each, PLBs are rugged, pocket-sized devices which can be attached to clothing and activated to transmit an immediate distress message to the coastguard in an emergency. If the fisherman falls overboard, is badly injured or the boat is sinking, the signal pinpoints his location, speeding up a rescue operation and saving vital time. Thanks to improved training and safety measures, less Western Isles fishermen lose their lives at sea compared to 10 years ago. But the rate of one death every 24 months is still far too high stress industry leaders. 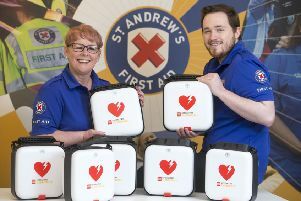 Duncan Macinnes, training manager with Western Isles Fisheries Training Association, is confident the donated devices will save lives, highlighting they complement the use of lifejackets. He added: “If you are wearing one of these devices the rescue services would be with you almost immediately. “There’s no question about it - wearing a lifejacket you could be in the sea and no-one knows you need help until you don’t come back in the evening. Identifying the position of a casualty at sea as soon as possible is of “paramount importance,” he stressed. Iain Mervyn’s daughter, Amy, threw herself into fundraising events with many thousands of pounds going to various worthwhile but large national charities. “I am a lot happier now the money is going to help fishermen in the community and knowing it will actually make a difference on the island. Her mother, Norma, said the sea and the associated fishing industry is something the family is passionate about. “Because we live on an island there are so many accidents and people are lost at sea. “My husband was a fisherman for many years. In Bernera you are used to being around the sea. He was always out at sea and we were always out at sea with him. Eventually, the group hopes to supply all fishermen across the Western Isles with the beacons. Picture are the Creelmen from Lewis and Harris who are among the first to receive the personal distress beacons. Front row left is Norma Macleod, widow. Centre is Duncan Macinnes, training manager with Western Isles Fisheries Training Association. Front right is Amy Macleod, daughter of Iain Mervyn Macleod.